This week, I recently uncovered a forgotten nail art treasure that I've actually had for a number of years. If you come across this gel ink pen called aqualip by Sakura, you have to get it in black at least! I'm not sure what it is made of but it functions like a true pen, and the ink flows out in liquid but will dry and harden and turn into plastic(?) So it is actually just like varnish in a pen. That makes it super useful in the world of nail art because, just imagine all the possibilities you can make with this bunch of pens! You can literally draw anything you'd like on your nails now and they make it so much easier to do! They do, however, come off a tad transparent except for the black and dark purple because I used to use them to draw on transparent folders for that stain glass effect. So white will come off as almost transparent. I am definitely going to restock my stash and use them to draw on phone covers as well. Yes, you can use them on any surface but I can't quite remember how to remove them other than scratching them off. You can try acetone. 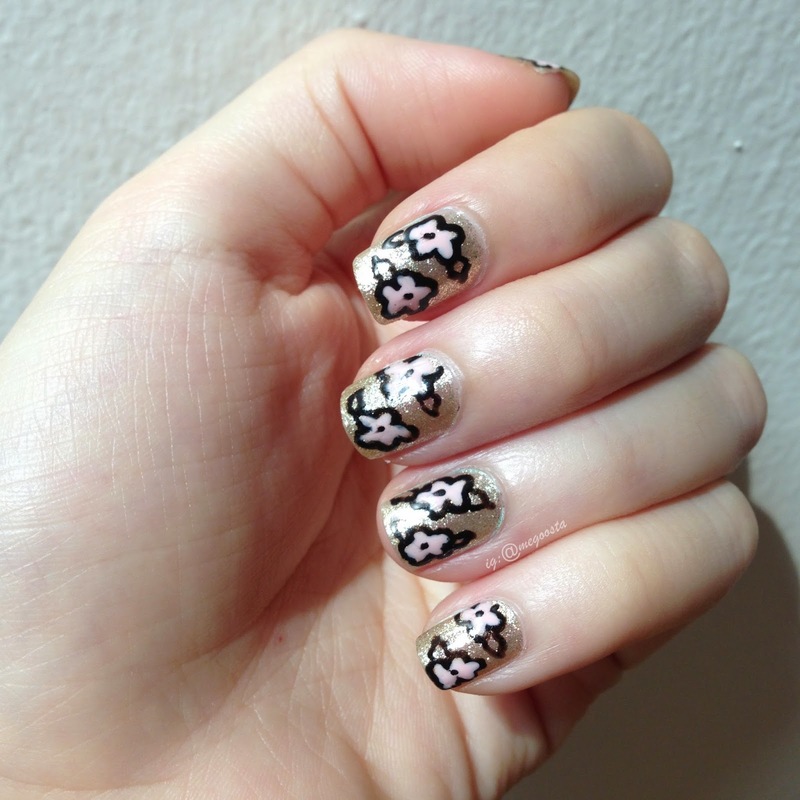 On to this week's nail art, I painted this in preparation for Chinese New Year. I used a glittery gold base and pink for flowers. Both colours are from Etude House. This has seriously become my favourite gold nail polish because it is just so shimmery and sparkly! Two coats of that and wait for it to dry. Remember, your nail polish has to be completely dry before you use the aqualip pen on it because you will need to apply some pressure to make the ink flow. Otherwise, you will end up denting your nail polish. For this colour, I only had to wait 15-20 minutes before it was completely dry. I'm guessing that it's because of the high glitter content. Draw on your florals and fill it in with colour and you are done! You can even paint on a top coat and the black ink will not smear unlike with permanent markers! I bought mine from Times bookshop at $2 each many many years ago, so I'm not sure if they still have them or where to find them at the moment. I will update this space again once I've restocked my stash. Update: I think they are called Glaze now.